Irish cross ornament features the traditional Irish blessing along with shamrocks. 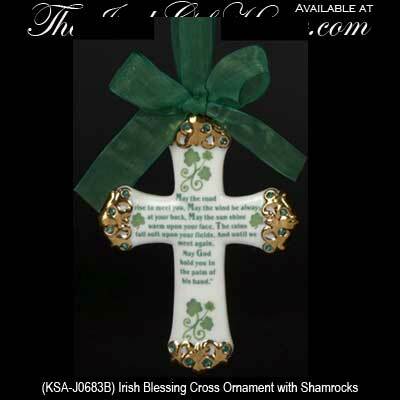 This Christmas ornament is a porcelain cross with an the Irish blessing and shamrocks. The cross ornament measures 3 1/2” wide x 5” tall and is gift boxed with Celtic cross and shamrock history card, complements of The Irish Gift House. This Irish ornament is from KSA and it is ready to hang with the included ribbon.